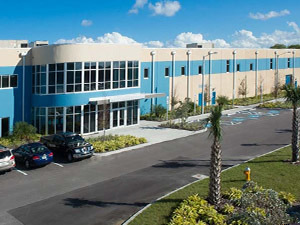 FLORIDA and PARIS, April 27, 2016 – Today, GE (NYSE: GE) opened the doors of its brand new Capacitor and Instrument Transformer Advanced Manufacturing Facility in Clearwater, Florida. GE's $60 million investment in the facility is a significant boost for economic development in the state and a reflection of GE's ongoing commitment to advancing American manufacturing. GE's new 190,000 square foot Center of Excellence, an expansion of its 40-year old instrument transformer facility in Clearwater, will produce instrument transformers and capacitors for the global market. The factory opening will create 275 new jobs in the Tampa Bay region, training its employees to operate the latest technologies and digital platforms. With the Clearwater factory, GE is meeting growing global demand with a 35% increase in capacity and a 50% reduction in manufacturing cycle time. The facility ushers in a new era of manufacturing for today's digital world as one of GE's first manufacturing factory to use the GE Predix™ Edge software. Predix™ serves as the foundation for all of GE's Industrial Internet applications, bringing together device connectivity, data integration and management, data analytics, cloud and mobility. At Clearwater, Predix™ will use real-time data from the site's sensor-enabled manufacturing equipment to predict outcomes and optimize the process. This includes design engineering feedback loops to enhance product quality and performance, plant efficiency and timely delivery to customers. As an early adopter of Predix™, the Clearwater facility will provide predictive and prescriptive analytics and actionable insights that will be transferable across all of GE's global manufacturing facilities, increasing operational and supply chain efficiency. GE has over 450 factories around the world where we are reimagining how products are designed, manufactured and serviced. We're combining new production processes with cutting-edge technology and digital analytics to change how we design and create. The Clearwater facility also boasts industry-leading product designs, including state-of-the-art drying ovens and refinery, sensor-enabled process equipment, and robotics to automate tasks, delivering more consistent, repeatable outcomes, accelerating innovation, speed and performance. Its vertically integrated operations provide for a consistent reduction of lead and cycle times across a wide variety of product configurations. With GE's continued digital investment, Clearwater will be the state-of-the-art Brilliant Factory of the future. Click here to view GE's new Clearwater factory image gallery. Click here to download images from GE's new Clearwater factory.